I used to hate bananas, especially overripe ones. I thought they were slimy and disgusting. I would avoid anything banana-flavored, even candy. I even had a dislike for the movie Herbie Goes Bananas. Yes, I hated bananas with a passion. Over the past year, though, my taste buds have changed. Don’t ask me how! Maybe it was all the different recipes I was trying with them. Maybe I was finally understanding how good for you bananas are. Whatever the reason, I have gone from loathing to loving bananas. Since I’ve started buying more bananas, that means I tend to have a lot of bananas left over which ripen quickly. What is one to do with all those leftover bananas? 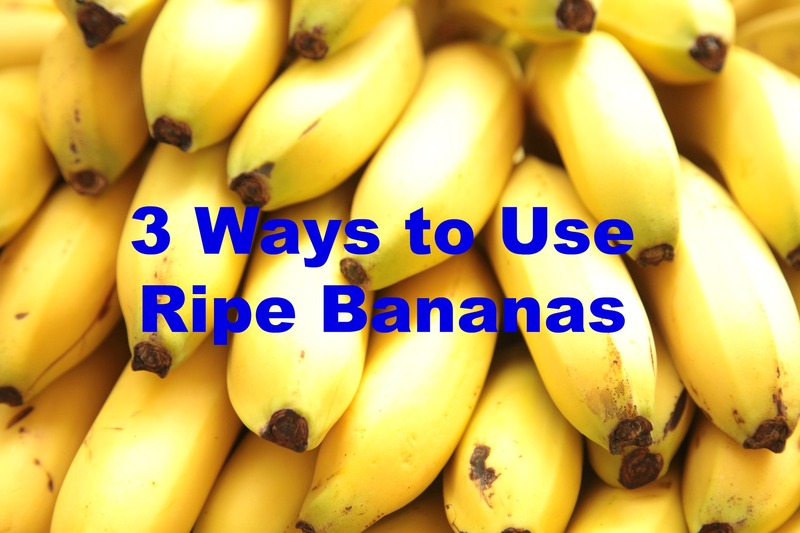 Here are 3 ways I’ve used leftover bananas when they start to get overripe. When I decided to try creating my first recipe, I looked at what ingredients I had and what seemed easy to make. The answer: use bananas to make pancakes. It took a lot of trial and error, but I was finally able to create my first original recipe. Along the way, I found that bananas go great in pancakes. So you can make Banana Split Pancakes, or search online for other banana pancake recipes. It’s a great way to get some fruit and extra vitamins into your breakfast. I’ve also tried bananas in muffins, and they are delicious. My friend shared a recipe for Banana Oatmeal Breakfast Muffins that I have sometimes made for on-the-go breakfasts. My kids love them (especially if there are chocolate chips in them!). There are endless possibilities when it comes to putting bananas in pancakes or muffins. It’s a great way to get some fruit and extra vitamins into your breakfast. This idea was inspired by one of my kids’ favorite shows, Daniel Tiger’s Neighborhood. Daniel Tiger’s mom loves banana bread. After watching an episode one day, the kids and I decided to try making our own just like they did on the show. After some online searching, we finally found Yummy in Your Tummy Banana Bread . It was simple and delicious. We’ve tried it with both wheat and white flour, and it turns out great no matter which flour we use. As a result, this has become our go-to recipe for banana bread. When those bananas start to look like they are going, peel them, put them in plastic bag, and store them in the freezer. Then, you have a good start for smoothies! I’ve found many combinations of fruit and green smoothies that call for frozen bananas. Save some money by freezing the ones you already have and you won’t have to buy bags of the frozen bananas. My kids and I enjoy this Blueberry Bliss smoothie! These are just a few ways my family has used overripe bananas that have worked for us. I love them for so many reasons! We are saving money by not wasting food. Making these are a simple way the kids can help out in the kitchen. They love to mash the bananas or push the buttons on the blender. So not only are we getting some extra nutrients, but we are spending time as a family! What are some ways that you use your leftover bananas?